Following last week’s analysis of the trends in global corn consumption, this week we look at global corn production. We examine which countries are the most important corn producers and how production area and yields have changed. Much like corn consumption, a small number of countries dominate corn production. This makes what happens in these countries particularly important to corn supplies in the short and long term. Again, the data used in this analysis is taken from the USDA’s Foreign Agriculture Service Production, Supply, and Distribution Database. Who are the World’s Largest Corn Producers? Last week we saw that two countries – the U.S. and China – accounted for 54% of 2016 corn consumption and the top 10 consuming nations accounted for 78% of corn consumption. Table 1 shows production of corn is even more concentrated. The top two producers – again, the U.S. and China – account for 58% of production and the top ten countries produced 86% of the world’s corn in 2016. Table 1. Total Domestic Corn Production and Growth of Production in the Ten Largest Corn Producing Countries as of 2016. As one would expect, world corn production has grown at roughly the same rate as consumption. However, some interesting trends emerge when looking at the growth experienced by various top corn producing countries. First, China’s corn production has grown slightly more slowly than its consumption which we saw last week grew at just over 4% per year. Second, while many of us are aware that the U.S. has nearly doubled corn production since 1990 (91% increase), many countries have seen even more dramatic growth rates. For example, Brazil, Argentina, Ukraine, and Russia have all seen spectacular rates of increase. Of this group, Brazil’s 256% growth over that period is the smallest! One mechanism that can be used to increase corn production is increasing the amount of land dedicated to producing it. Table 2 shows the acreage devoted to corn production in each of these countries and how that acreage has changed over time. Table 2. Total Acres of Corn Harvested and Changes in Acres Harvested in the Ten Largest Corn Producing Countries as of 2016. The world area of harvested corn has increased at a pace of 1.32% annually since 1990. There are a couple of interesting details in this table. First, China has expanded corn acreage at roughly double the pace of the U.S. China harvested the largest corn area in the world in 2016 and has done so since 2013. Prior to that the U.S. harvested the largest area of corn in the world. Turning to South America, contrary to what most might have guessed, the rate of growth in harvested corn area in Brazil lagged that in the U.S. Argentina on the other hand, has grown corn acres much more rapidly. Mexico also produces corn on considerable amount of land, but has not increased the acres of corn production very rapidly. Finally, the largest increases in harvested corn acres were seen in the Ukraine and Russia. Each increased harvested corn area by over 240%. 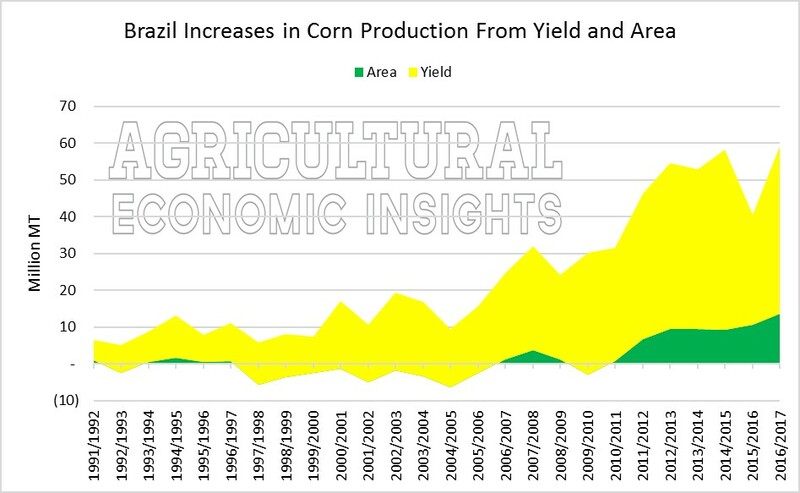 Yield increases have also been key to increasing corn production. The world corn yield increased at 1.3% per year from 1990-2016. The U.S. generally produces the highest yielding corn crop in the world. However, some countries have made significant progress toward achieving U.S. level yields. Figure 3 shows corn yields in three countries and the world relative to the U.S. Typically, the world average corn yield (shown in blue) is roughly half the U.S. yield. In most years, China’s corn yields (shown in red) are much lower than the U.S. During low U.S. production years in 1993 and 2012 they reached nearly 80% of U.S. levels. The last few years have found them to be slightly better than the world average. Argentina and Ukraine have both shown substantial improvement relative to the U.S. yields. In the case of Ukraine their corn yields have recently crossed the world average. This is a considerable improvement after spending many years with yields bouncing from just 30 to 50% of U.S. levels. 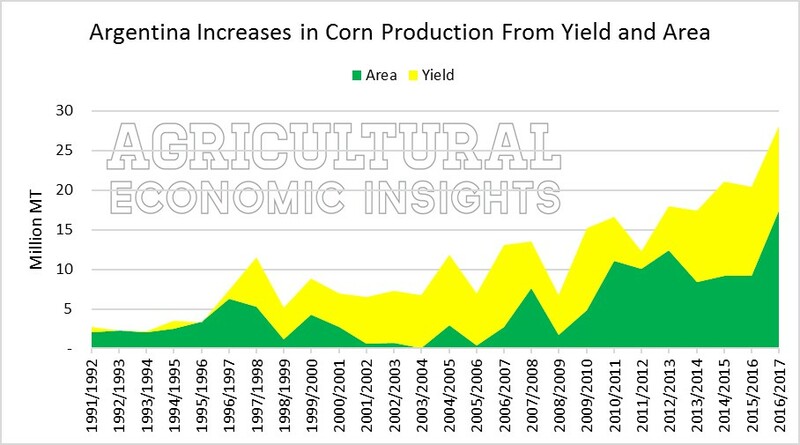 Argentina has also made significant strides in corn yields. In the last seven years, they have regularly attained corn yields at 70% of U.S. levels. Figure 1. Corn Yields as a Percent of U.S. Yields, 1990-2016. As can be seen above, most countries have increased corn production through a combination of increased acreage and increased yields. World corn production has increased by roughly 600 million metric tons since 1990. Figure 2 decomposes this increase into changes that resulted from increasing acreage and increasing yields. The changes were calculated by holding area constant for a given year and calculating the yield impact and then holding yield constant and calculating the area impact. The combined impact is approximately equal to the total change in corn production. The approach is like the one that we used in this post and similar to the approach used by the ERS to generate this chart. It should be noted that there are other more sophisticated and precise methods that can be used to estimate these impacts, but we will stick with the simple approach here. Figure 2. Increase in World Corn Production Due to Changes in Yield and Harvested Area, 1990-2016. Since 1990, 56% of the increase in world corn production has been achieved through higher yields, and the remaining 44% has come from increased acres in corn production. It is interesting to see how this graph differs across countries. Below we show these graphs for the U.S. and China. What is immediately obvious is the relative size of the yellow (yield) and green (acreage) areas. In the case of China, much of the increased production 67% has come through increasing acreage (green). In the U.S., the proportions are roughly reversed with 37% coming from increasing acreage. For those interested in some other countries you can find Brazil here (yield increases dominate) and Argentina here (looks a lot like China). Figure 3. Increase in Chinese Corn Production Due to Changes in Yield and Harvested Area, 1990-2016. Figure 4. Increase in U.S. Corn Production Due to Changes in Yield and Harvested Area, 1990-2016. As was the case with consumption, the U.S. and China are by far the largest corn producing countries. U.S. corn production grew at a slightly slower rate than world production from 1990-2016 and China grew a little faster. Still, China’s growth in corn production is slightly slower than its increase in corn consumption. The world has significantly increased corn production in recent years. Countries can expand corn production through a combination of increasing yields and increasing the land area devoted to a crop. In the case of corn, both factors have been used extensively. The U.S. continues to produce the highest corn yields in the world. The average corn yield in the world is roughly at the same level relative to U.S. production as it was in 1990. In other words, it does not appear that U.S. yields are significantly falling back to the pack. However, some countries have made strides. 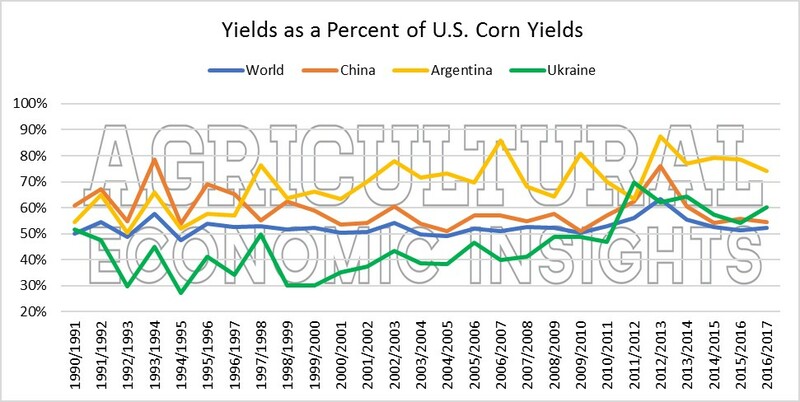 Notable among those are Argentina which regularly produces yields that are within 20% of U.S. levels. Others, such as the Ukraine, are not yet close to U.S. production levels, but have significantly increased their yields in recent years. Our simple estimates indicate that roughly 55% of the world increase in corn production has resulted from increased yields and 45% from increased acreage. In the U.S., this proportion about 37% for area and 63% from yields. As we go forward it will be important to monitor yields in the major corn producing countries to determine if they can gain further ground on the U.S. In the case of China, it will be key make strides in yields if they are to continue to increase production.